Today, we can’t escape time; our phones, tablets, smart watches, and social media feeds remind us constantly. It wasn’t always so. 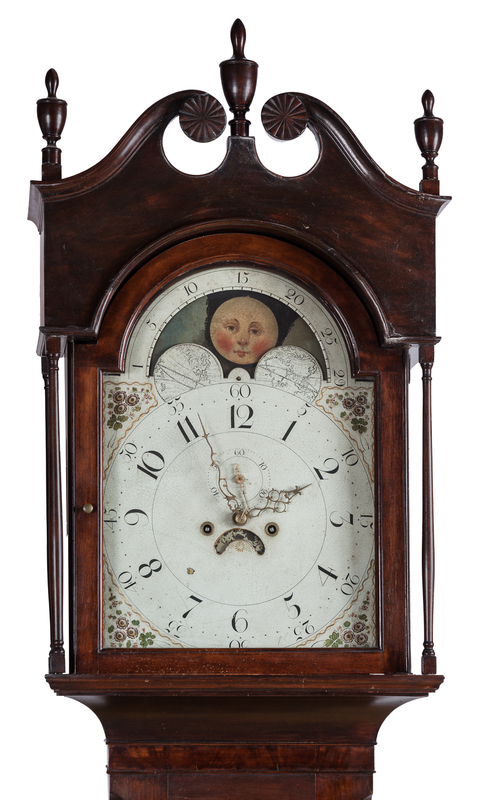 In early nineteenth-century Kentucky, clocks and watches were a costly investment—especially tall case, “grandfather” clocks. Making Time, the first exhibition devoted to Kentucky tall clocks, will bring together more than twenty outstanding examples of these towering creations. When shown side-by-side, the clocks reveal the distinctive hands of many Kentucky cabinetmakers and clockmakers; illustrate the hidden world of gears, bells, weights, and pendulums that kept a clock running and chiming; and record the complex webs of craft, taste, and trade needed to make these practical works of art. What are the clues that insiders use to understand Kentucky tall case clocks and connect them to certain places and makers? What made up a tall case clock and how did it work? What do the clock works look like and how do they operate? What types of artisans were involved in making a tall case clock and what were their jobs? Who would have used tall case clocks and where would they have been used? What was the significance of personal time-keeping in the early nineteenth century?